James the Just seeks to present a truly “messianic commentary” for the church. Written by Dr. David Friedman, the volume covers topical essays on the book of James and is not in fact an exegetical commentary. This is stated up front (xii) but is increasingly disappointing as one reads through the topics that are actually discussed. 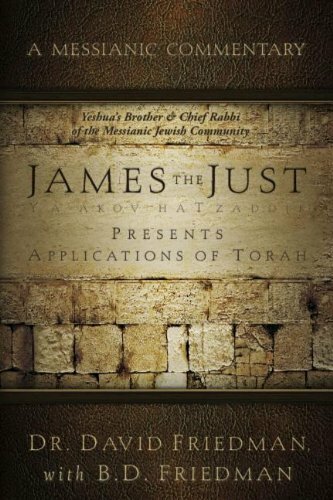 The books of James as yalqut (a collection of sayings) (chapter 1) and parashat kedoshim (instruction/teaching on Leviticus 29-21) (chapter 2) are the primary elements of originality to James the Just. However, even Dr. Friedman notes that previous New Testament scholars have picked up on the correlation to the book of Leviticus (15). The chapter dealing with “Who was Ya’akov” (chapter 3) is almost entirely speculation from the book of Acts. Though this is possibly insightful, it is hard to see how this is in anyway pertinent to the exegetical elements required to understand the book of James. Ultimately, this doesn’t prove a problem for Dr. Friedman since he does not participate in exegetical efforts. The concluding chapters of James the Just are the most interesting. Chapter four deals with “The Torah Based Concepts Behind the Greek” while chapter five deals with “Faith and Works.” There are interesting sections in the fourth chapter on the “prayers of a righteous man” (70-74) and the anointing oil of James 5:14-15 (74-77). The chapter is presented to prove that James was not written with a Hellenistic background (63). However, this is Torah-based origin is not a novel opinion since no scholarly commentary has espoused a Hellenistic view. Similarly in chapter five, Dr. Friedman defends a unified look at faith and works with which every Protestant individual would agree. Nothing is presented as uniquely Messianic expect for the retention of the Torah, which is not unique since it has a history in the Reformed Theonomic tradition. In conclusion, James the Just is not a true exegetical commentary. For those seeking a series of lectures/essays on the book of James this volume is insightful. However, there is nothing contained in this volume that is not found in a higher criticism commentary on the book of James. Even the “messianic focus” of the material seems timid in its depth and will prove to be short on insights for those familiar with technical scholarship on James.